We at GAIA feel honored when people want to donate their time, money or materials to help us in our objectives to protect the wild natural resources of Nicaragua. Some people help with our activities as Eco-Warrior Environmental Volunteers, conducting lots of tasks that are important to nature such as reforestation, maintenance, and assistance with wild animal rescue. We love to share our time and efforts with people who share our opinions about the importance of protecting wild nature. Not everyone can give a block of time to a project such as reforestation. Some people prefer to help by making a small financial donation, or provide some of the materials that are required for our operations, such as foods for animals and containers for planting trees. We want to express our gratitude to the many people who have given small, or sometimes, not so small, material or financial donations to help us do what we do. A few such donations received during the most recent days are mentioned below. Seeds were donated by the owners of Apoyo Lodge-thank you! 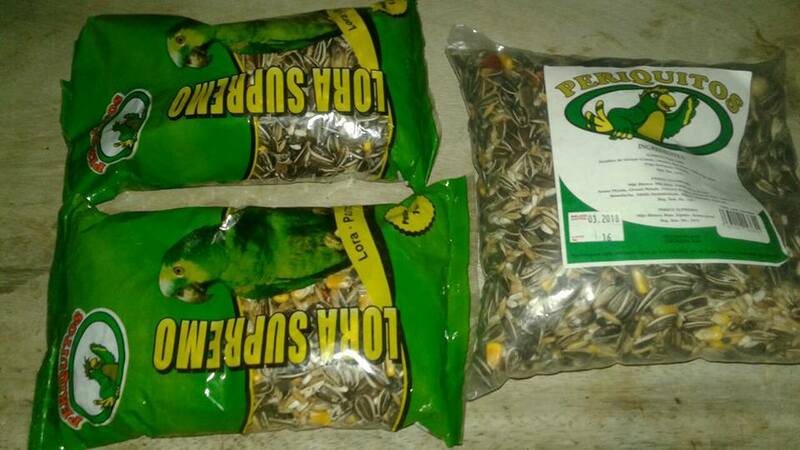 The great folks at Apoyo Lodge dropped by to share with us and they shared their wealth by donating sunflower seeds. It is worth noting that Apoyo Lodge has changed hands, and the new proprietors are particularly kind and conscientious, as is evidenced by their donation of sunflower seeds for the benefit important nutrients. Our rescue macaw has a flexible diet but, like all parrots, requires certain components, among them, seeds which carry certain small-scale nutrients that this bird may not obtain from the other foods in its daily diet in captivity. The kinds veterinarians at WorldVets donated a surgery for Juju the kinkajou, and some juicy fruits which were readily devoured. 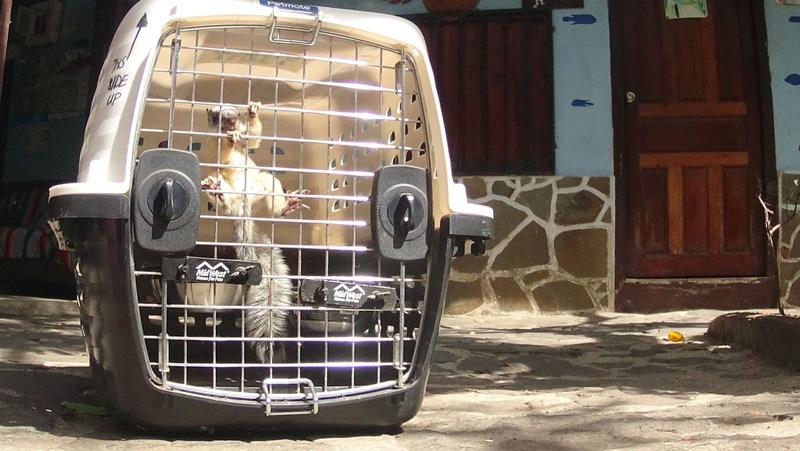 Steve and the team from WorldVets donated a costly treatment of surgeries to Juju, a wild kinkajou that was found badly beaten in Laguna de Apoyo Nature Reserve. The animal was given a chance to live by these operations, which included the removal of a foot and an eye, and closure of an open wound on one cheek. The team dropped in a couple of times to see Juju, and they brought the animal some fruit. 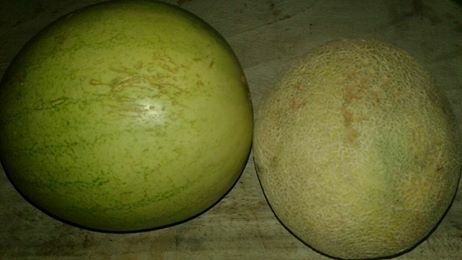 From all appearances, watermelon ranks highly in the list of preferred foods for a kinkajou. We often receive severely injured wildlife, and sometimes the success of seeing them heal is worth it all! 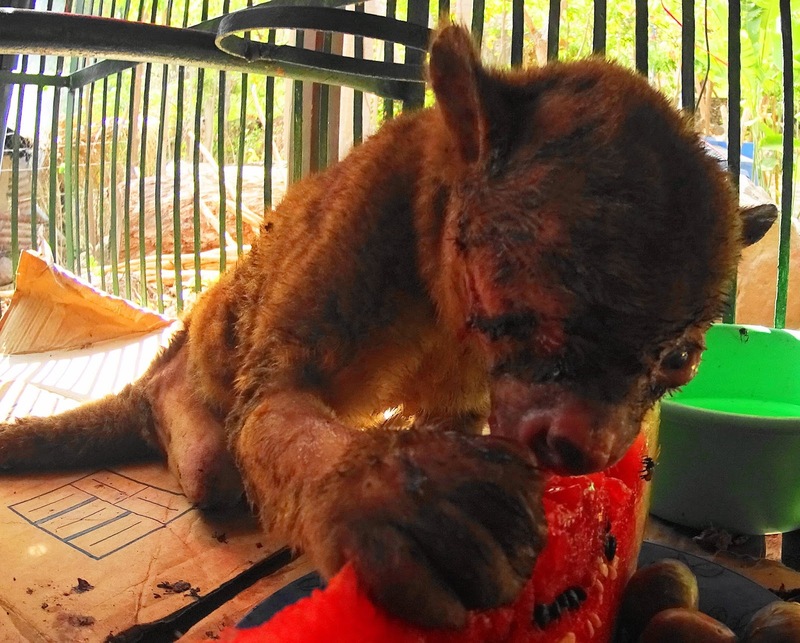 Juju the kinkajou likes watermelon. Photo Andras Dorgai. 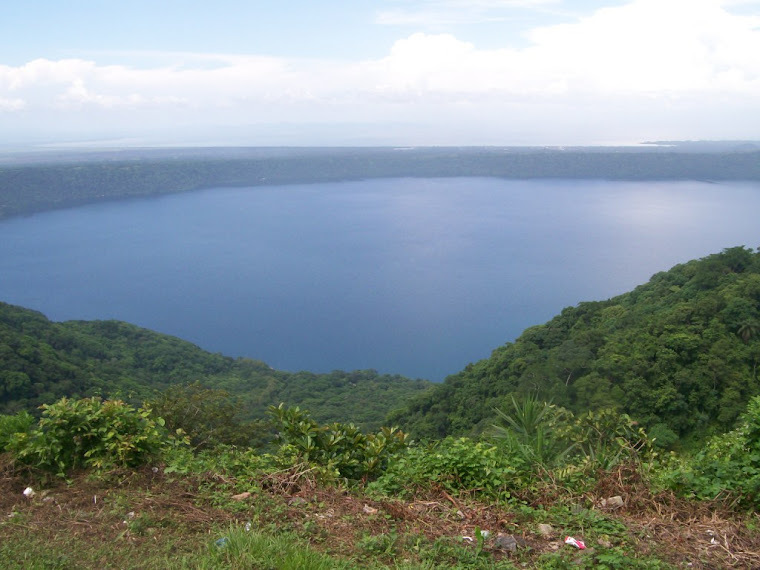 There are lots of options for a visit to Laguna de Apoyo these days. The people who visit us often want to be involved in some way in doing something good for the environment. Part of keeping the environment safe for wild nature is patrolling to reduce vandalism, hunting, other bad things that harm the public good. We at Gaia support the local institutions in the ways we can. We had noticed the local patrol motorcycle for the police department was using a completely treadless tire, worn dangerously bald from overuse. Mark Connell, a student of Apoyo Spanish School, took note of our concern and provided a cash donation which covered most of the cost of the tire. We compared prices and models and acquired the best fit for the job, and made an official delivery to the police representative. Now he can participate in hot pursuit safely! 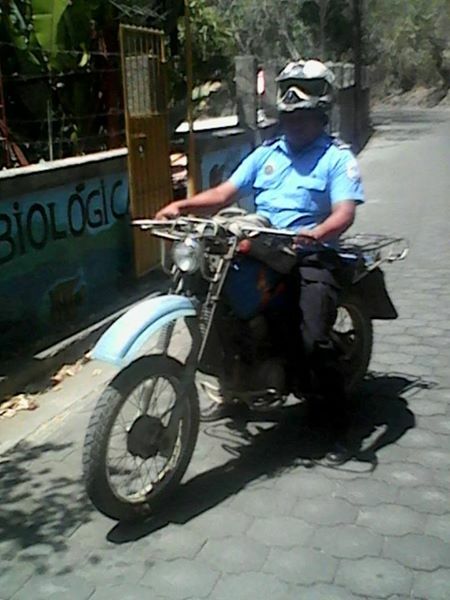 Our local police representative in Laguna de Apoyo desperately needed a new front tire for his patrol motorcycle, which was donated by Mark Connell and funds from Gaia. 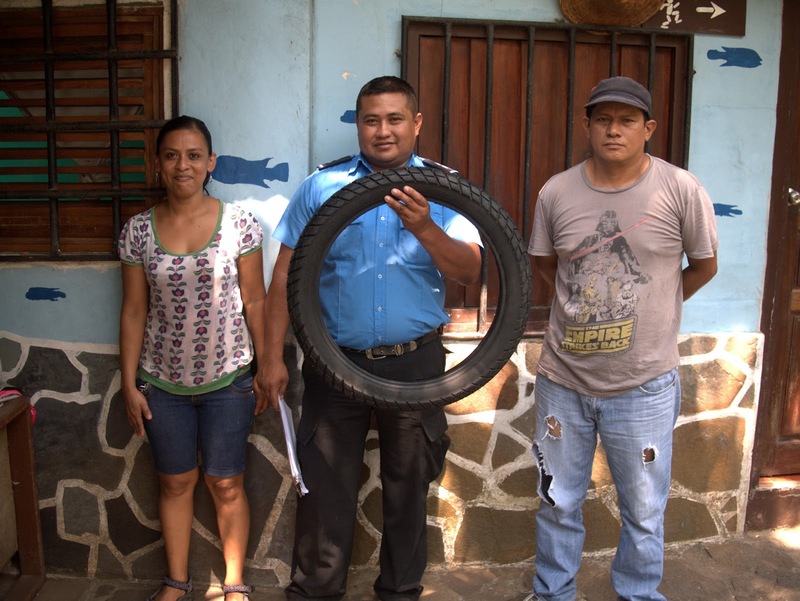 Here, Juan Carlos presents the new tire along with Pablo and Mileidy from Gaia. Photo Jeffrey McCrary. The next time we saw him pass by on the motorcycle, we stopped to ask about the tire, and sure enough, he had already had it mounted on the bike. Our local police motorcycle now sports a fully new front tire! Photo Jeffrey McCrary. We don't have any large bank accounts to fund projects without some sort of financing, which is a cruel reality for most not-for-profits that are really doing things of benefit to our society. We depend on contributions from our allies and friends. Sometimes, the contributions are small, but really, no contribution is ever to small. Every penny can be put to use in the protection of wild nature in Nicaragua. Missie and Stephen Lavergne recently gave us two (yes, two!) animal transporters-not exactly a small contribution. 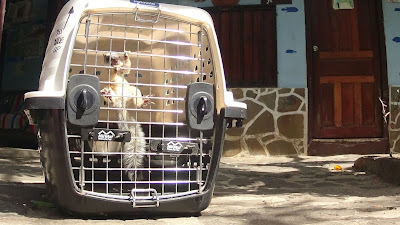 The transporters are in nearly-new condition and capable of handling animals of different sizes. Who said Christmas doesn't come in April? 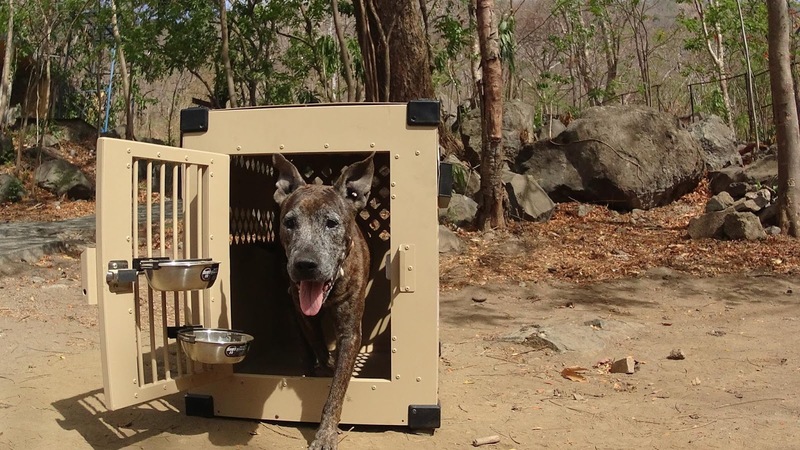 It will now be more feasible to transport animals-both wildlife and pets such as Lassie. 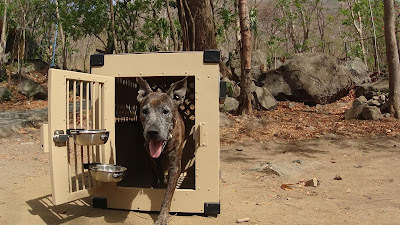 Lassie tries our our new large-animal transporter, donated by Missy and Stephen Lavergne. Photo Jeffrey McCrary. The smaller animal transporter donated generously by Stephen and Missy Lavergne is just right for small and medium-sized animals. Thank you! Photo Andras Dorgai. Lassie, our newest pet addition, was rescued from the street in Managua. For the next long trip, she now has some very comfortable conditions for traveling. Photo Andras Dorgai. Andras Dorgai has been learning Spanish and helping as an Eco-Warrior Environmental Volunteer. Not only has he provided lots of great help, he also donated a bag of walnuts to the animals. Anyone who has been in Nicaragua knows that they can be very expensive and the cost can seem even more prohibitive when contrasting to the incomes found in Nicaragua. It is not easy for us to keep the animals fed with high-quality foods that meet their special, nutritional needs without donations. Midorna, our rescue Scarlet Macaw, needs nuts as part of her diet, so she is getting a small quantity daily. Dorgai is passing a walnut to Midorna, part of their daily ritual. Photo Jeffrey McCrary. Lots of others have donated items and cash recently, particularly in support of our studies of the wild natural resources in the area. The examples mentioned here are presented to demonstrate the diversity of ways to help available. We want to thank everyone who has made a donation. If you would like to donate to Gaia, please click on the "escudo" below or just come by Estacion Biologica Laguna de Apoyo any time!